Konami’s first original shoot-em-up was the arcade game Scramble. 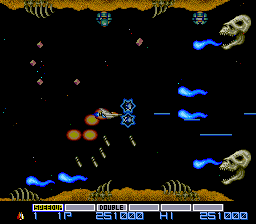 While Scramble saw a follow-up called Super Cobra, a different project started out as the actual “Scramble 2.” But by the time it was released in 1985, the team led by main programmer Hiroyasu Machiguchi took the concept in a different direction, and thus was born Gradius (pronounced “grah-dee-us”). 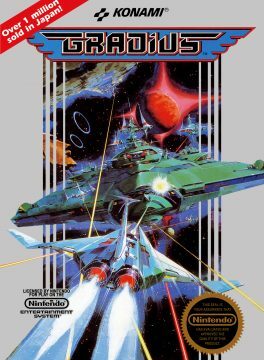 Gradius features some similarities to Scramble – both are side-scrolling, both feature a bombing attack that allows the ship to attack enemies on the ground, and both feature a checkpoint system where the player would be sent back to an earlier point in the level after losing. 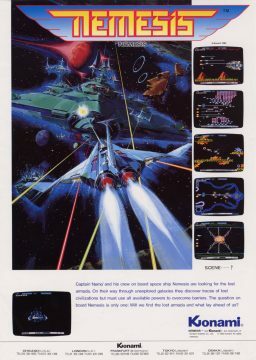 However, for Gradius, the need to refuel the ship was ditched, and the expanded memory allowed for a wider variety of levels and weapons. With this, Konami revolutionized the shoot-em-up genre. 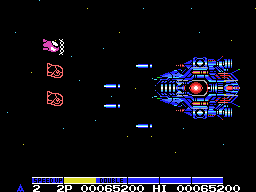 The main ship of the Gradius games is the Vic Viper, which is colored in blue. (The companion ship which appears in later games, the Lord British, has a similar design, except it’s colored red.) Its mission? 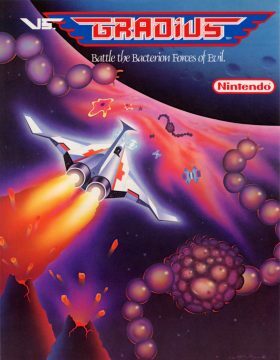 Protect the planet Gradius from the evil Bacterian army. 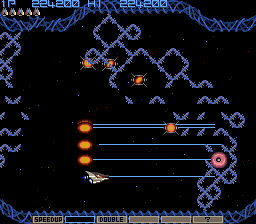 Each level in Gradius usually consists of three segments. 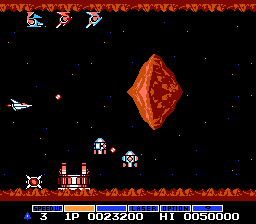 The first is the “sky” segment, which consists of an outer space background and a number of simple enemies. These are meant to allow the player to gain power-ups between levels. The second segment is the actual stage. 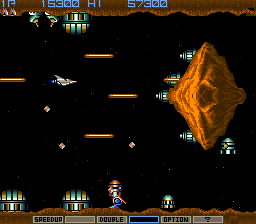 Each level in Gradius has some kind of theme to it – a cave level, a fire level, a plant level, a biological level, and so on. The final segment is the boss. After defeating it, the stage will fade into the background, and the navigation segment for the next level starts. The Vic Viper can only take a single hit before being destroyed, which will send you back to an earlier checkpoint. 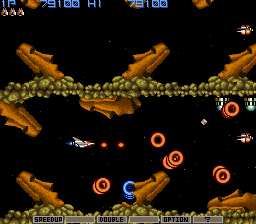 Each level in the Gradius games has a number of recurring elements. The most prominent are the Moai heads, based on the weird statues from Easter Island, which shoot glowing rings at you from every angle. Many of these cap off with a fight against numerous gigantic Moais. 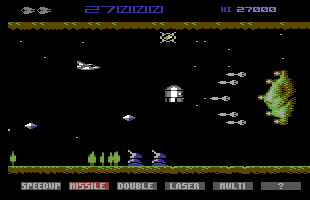 There are also “Zub Rushes”, where numerous orbs appear randomly around the screen and charge at you. There are also the bosses. 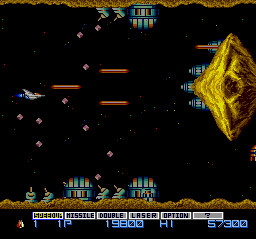 In Gradius, the Big Core is one of the only bosses, which is repeated at the end of almost every stage. The weak point is a core in the middle of the ship, guarded by a small series of barriers. After shooting through the barriers, one can eventually damage the core, which makes it turn shades of red before it explodes. 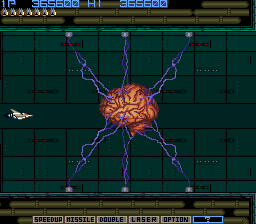 Nearly every major enemy ship in Gradius has some variation of this, and many of them have multiple cores. 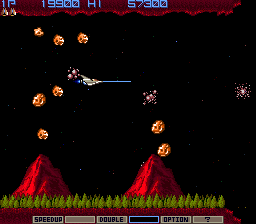 This is where the famous Gradius catchphrase “Shoot the core!” – introduced in the second game – comes from. It’s a friendly bit of advice shouted by an unseen narrator. 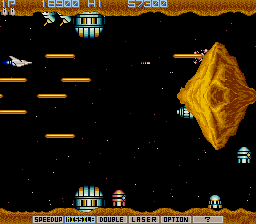 A recurring trend in the Gradius games is a defenseless last boss, which will sit and maybe shoot a few projectiles at you, but can easily be destroyed without much effort. 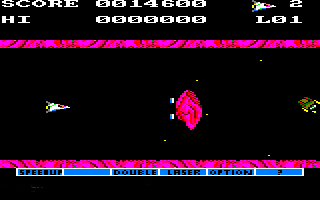 Most of the endings are the same as well – the Vic Viper escapes from an exploding mothership or planet and flies off to safety, while the credits begin to roll. As an interesting touch, the high score table asks you to enter your initials, your gender, and your astrological sign. 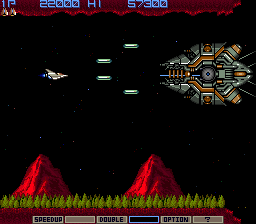 The most unique element of Gradius is the power-up system, which allows you to customize your weaponry. When you destroy a wave of enemies or kill a red colored foe, they’ll drop an orb. Grabbing one will activate the power meter. Each collected capsule advances the power meter by one step. At any point, the player can activate the highlighted item, receive it, and then the power meter resets. The first is the Speed Up, which obviously makes the ship faster. The second is the Missile, which fires a missile projectile diagonally, which can be used to hit enemies that your regular guns can’t reach. 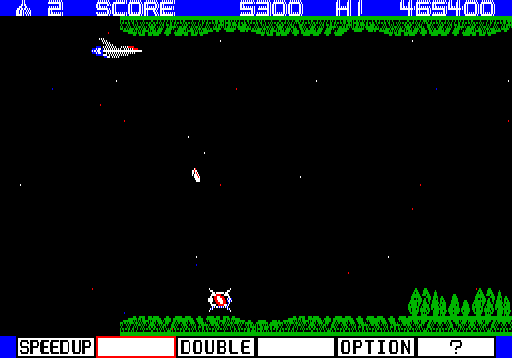 In the arcade games, Missiles are fired by a separate button, but in many console ports the regular and Missile attacks are assigned to the same button. The Double weapon fires in two directions simultaneously. 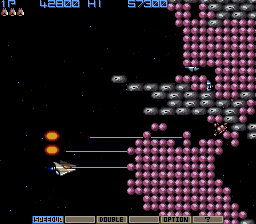 In Gradius, one shot will fire straight forward, another at an upward angle. It’s weak, with a lower rate of fire than even the default weapon, but it’s much more versatile. The Laser is a powerful weapon that shoots straight forward, and can usually tear through multiple enemies and do quite a bit of damage to bosses. 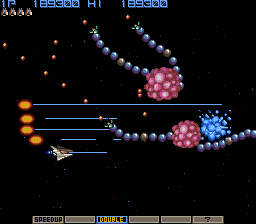 The Option (in some games called Multiple) summons a little glowing ball that shadows the movement of the main ship and provides extra firepower. 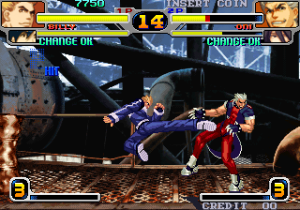 In the arcade games, you can have up to four Options, essentially quintupling attack power. When there are too many Options, the game may spawn an “Option Hunter” that tries to rob them. The “?” ability is actually a Shield, which equips two orbs in the front of the ship, allowing it to absorb a few frontal hits. 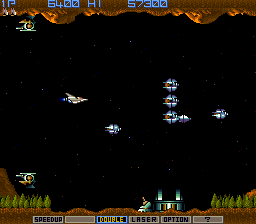 Every Gradius game after the first one features a variety of payloads, Option formations, and shield types. The genius of the power meter system is that it allows you prioritize the weaponry to suit one’s individual playing style. Some people might want to play it safe and try to get the Shield as soon as possible, while others may want to take a risk to equip themselves with Lasers and Options. Sometimes certain areas are easier with the Double weapon, so switching equipment can be helpful. However, it does lead to a problem unofficially known as “Gradius Syndrome”. When the Vic Viper is fully powered up, the game tends to be pretty easy. It can still be destroyed if you’tr not careful, upon which it loses all weapons and starts the segment with nothing. With the standard weapons, the ship is weak, and some areas prove far too difficult under these circumstances. A huge amount of the challenge comes with wiggling your way out of sticky situations without the benefit of extra weapons, and slowly rebuilding the arsenal. This is especially true with boss battles, because you rarely get the opportunity to completely rearm oneself after getting killed. There is a “rank” system, where enemies fire faster and more numerous bullets based on how many weapons are activated, but it never quite manages to restore the balance. 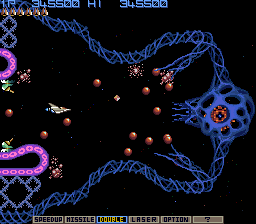 Gradius also has a unique musical style. The original arcade game features a very upbeat and peppy soundtrack. Most of the subsequent games keep this style, which contrasts to the darker, rock or techno inspired soundtracks found in most shooters. The first level theme is named “Challenger 1985”, most likely after the space shuttle which unfortunately experienced a great disaster the following year. 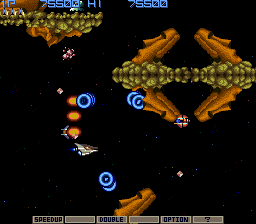 Gradius began in the arcades, and the games can get mighty difficult. Nearly all of the titles have been ported to the home consoles, and they’re usually rebalanced so those with less than superhuman shooter skills can actually stand a chance. 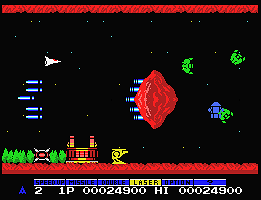 There are seven stages here – a cave level, a level filled with destructible red dots, another cave level, a Moai stage, an outer space stage consisting of pulsing organic meteors with huge tentacles, a strange level that feels almost like a spider web, and the final base. 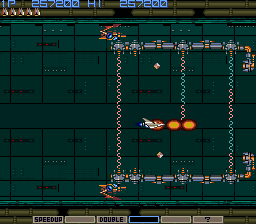 In comparison to the later games, Gradius is pretty barebones, especially with its limited weapon selection. However, the level design is still pretty solid, and it’s difficult without being frustrating, so it’s still quite playable. 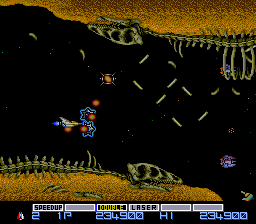 The graphics are excellent for a game from 1985 – it doesn’t hold a candle to R-Type, but that came more than two years later. The music is catchy, but the blippy synth of the arcade version is a bit harsh on the ears. The soundtrack was composed by Miki Higashino, one of Konami’s most prolific composers. 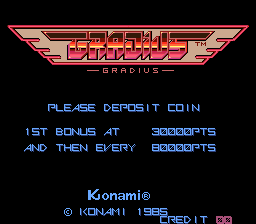 Gradius was originally distributed in arcades using a bubble system, a magnetic cartridge different from the typical ROM boards. It order for it to work, it needed to be heated up, which is why certain versions display a timer when you begin the game. It plays a catchy song known as “Morning Music”. Some other early Konami arcade games like TwinBee also used this system, although it eventually failed and Konami went back to standard ROMs. 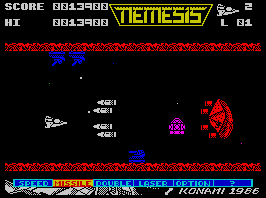 In Europe, some versions of the game are called Nemesis. This includes the arcade version, which lets you continue three times, whereas the Japanese version doesn’t let you continue at all. However, it’s more difficult overall, due to the quickly escalating rank. The NES port is well done. The graphics have taken a hit, enemies aren’t as numerous and the Big Core boss is smaller, but otherwise it’s about the same. However, since the NES can’t handle too many sprites, you’re only allowed two Options instead of four. Also, the levels that scroll vertically, like the Moai stage, are now fixed so the screen can’t move up and down. A few secret warp areas have been added to skip certain levels. The Japanese version features messages after completing various loops. The English manual also refers to the ship as the Warp Rattler rather than the Vic Viper. 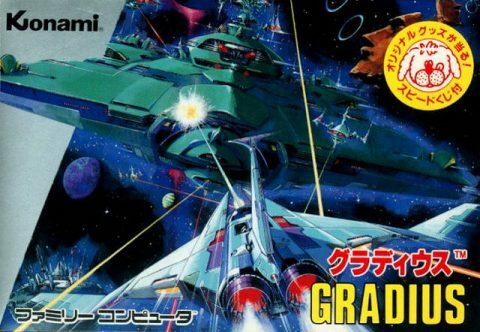 There was a special version released in Japan for the Famicom called Gradius Archimendes Hen, which is a special promotion cartridge that was a tie-in with a ramen company. Here, all of the power up capsules have been replaced by floating bowls of noodles. 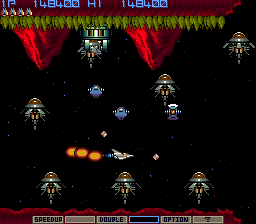 Gradius also appeared as a Vs. cabinet in the arcades, based off the NES version. The NES version was also released on the Wii Virtual Console and the 3DS eShop. 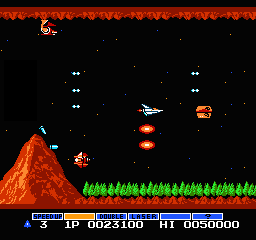 The MSX version suffers from the same issue as all of the other shooters for the system – the sprites move smoothly, but the scrolling is incredibly choppy, which makes it hard to judge the speed of projectiles. It makes the game harder than it really is, and can be quite headache inducing. It also suffers from the same restrictions as the NES version – miniaturized bosses, limited Options, and no vertical scrolling. It also adds an extra level, which takes place in a graveyard, plus two hidden bonus levels, which have an exclusive music track. If you stick a TwinBee cartridge in the second slot, the Vic Viper turns into TwinBee. This is also the first game in the series that lets you strengthen the weapons by selecting them twice from the power meter. The cartridge version music is about the same quality as the NES version. However, the version featured on the Game Collection 3 disk release supports the SCC+ cartridge for enhanced music. The Commodore 64 version is a little slow and the graphics are extremely flickery, but it’s playable. There’s an option for either sound effects or music, though there are only two tracks. 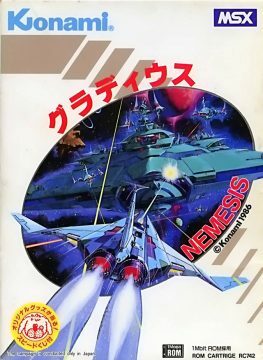 During the loading sequence, a digitized voice says “Nemesis, the final challenge”. The Amstrad CPC and ZX Spectrum versions, however, are terrible. The speed is all off, the scrolling is jerky, and the hit detection is extremely glitchy. All three of these ports are have less checkpoints, so they’re more difficult, plus the level designs are simplified somewhat, but they all have the extra graveyard level from the MSX version. The Sharp X1 and PC88 versions have choppy animation, but they still look and play more faithfully than the European PC conversions. The X1 version has better colors but the PC88 version benefits from a superior FM synth soundtrack. The X68000 version is basically arcade perfect. The PC Engine version is quite faithful, with slightly upgraded graphics. The music and sound effects have been improved, and are the best out of all the releases. 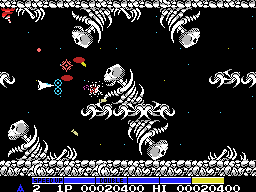 It also features an enhanced version of the graveyard level found in the MSX version. The screen size has been reduced a bit to fit the status bar at the bottom of the screen, so it scrolls up and down a bit. The game appears on several compilations as well. 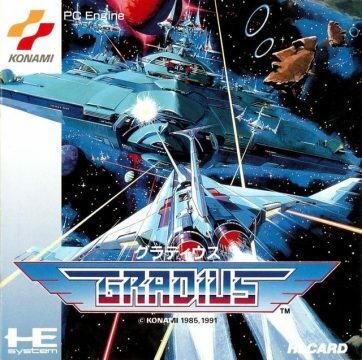 The Gradius Deluxe Pack (PlayStation, Saturn, and PC), Gradius Collection (PSP), and Konami Arcade Classics (NDS) versions are straight ports of the arcade game, with the ability to turn off the original slowdown. The Deluxe Pack features a piano rendition of the main theme when you beat the game. There’s also a bonus CGI intro movie for the Saturn, PlayStation, and PSP, which is the same in all versions. The DS version has full access to all of the dip switches. It can’t fit the whole playing field, like the PCE version, so it needs to scroll up and down.